One of the blogs I enjoy reading on a regular basis is SierraJournal.com, run by Matthew DiPietro, a Bay Area tech and communications specialist. Matt seems to have a knack for finding interesting and news-worthy backcountry tidbits to write about, and does a far better job staying on topic than I ever could. 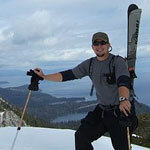 He also runs occasional climbing and backcountry skiing trip reports, like skiing Matterhorn Peak's East Couloir. Matt's site used to be called sierra-alpinist.com, but he wanted to branch out to cover environmental and alpine news as well as offering climbing TR's, so he nabbed the SierraJournal domain and hit the ground running. Sierra Journal was born of a passion for mountain climbing, backcountry skiing and wilderness travel in the Sierra Nevada. Sierra Journal's mission is to provide great outdoor-related content in the form of trip reports, mountain adventure narratives, environmental news, local and national mountain-related news, gear reviews, and other outdoor tidbits. SierraJournal is one of a very few active Sierra-themed blogs I know about. If you haven't already visited, browse on over and check it out.